You likely know that improving your strength calls for targeting three major lower-body muscle groups—quads,glutes, and hamstrings. But they’re not the only players in the game. Despite their smaller size, your calf and ankle muscles are just as important for improving strength and pushing shape. Why won’t my calves get bigger? A question always on the mind of your average gymbro. Are my calves small? To some this may seem like an unimportant afterthought in training, but the calves play a role much greater than just the aesthetic. They are the foundation of athleticism: without strong, supple and powerful calves, we wouldn’t be able to to half of the athletic feats we’ve accomplished. So much so that in the old times, people thought that a lack of prominent calves represented weakness. There are many reasons why you might want to train your calves, and as far as I’m concerned, any reason that gets you training is a good reason. In this article, you will learn all you need to know about calf training at home and go away with a clear understanding and an action plan to boot. Skip, bringing your front knee to waist height and your opposite arm forward. Keep your back leg straight and focus on pushing off and landing on your toes, always engaging the calves. Continue for about 100 feet, walk back, and repeat twice for a total of 3 sets of skips. Repeat the same motion as a forward skip, but explode upward each time your foot leaves the ground. Stand with feet hip-width apart; rise to the balls of your feet. Keeping knees stiff (but not locked), quickly hop up and down. Do 3 sets of 20 jumps. Jump clockwise in a box shape—first about a foot forward, then to the right, then backward, then to the left. Reverse direction and repeat for 1 set. Step forward with your right leg and lower into a lunge. Lift and lower your right heel for 10 to 12 reps, keeping your spine straight and weight over your big toe. Push off your front foot to return to standing. Switch legs and repeat for 1 set. Sit on a bench or chair, resting the balls of your feet on a block about 12 inches in front of you. 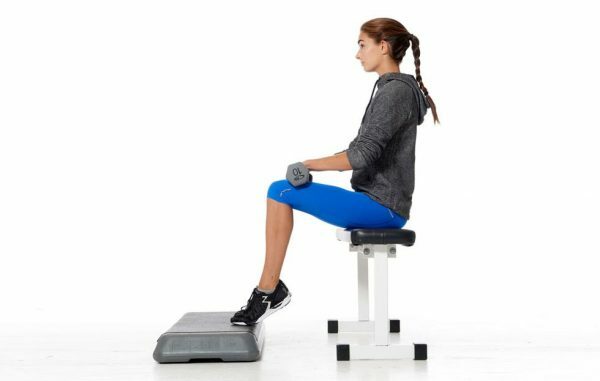 Place a weight plate, dumbbells, or a heavy object (like a box with books in it) on your thighs, about 3 inches above your knees. Lift your heels as high as possible, squeezing your calves. Slowly drop your heels as low as possible, until you feel a stretch in your calves. Do 10 to 12 reps for 1 set. Stand on the edge of a step, letting your heels hang slightly lower than your toes. Rise onto the balls of your feet, engaging your calves. 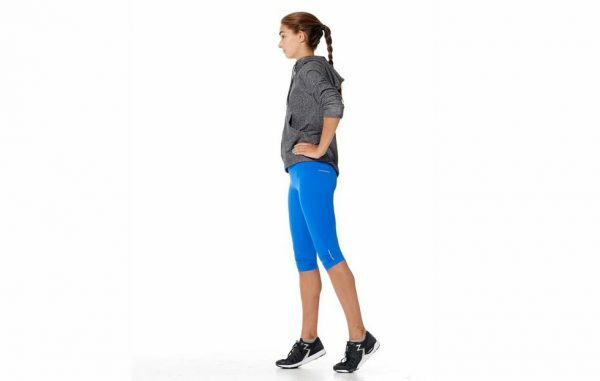 Keeping knees straight but not locked, lower down until you feel a stretch in your calves. For an added challenge, hold a dumbbell in one or both hands. Relax for a few seconds, then turn around and repeat in other direction. To make it harder, carry a dumbbell in each hand.